Spending time outdoors has long been touted as a healthy activity. The fresh air is invigorating, and it’s always exciting to step outside after a long winter… but, weather can prevent those relaxing afternoons spent lounging on the porch in any season. Awnings are the perfect way to combat mother nature’s wrath, but finding the one that fits your needs can be a time consuming venture. There are many companies that offer even more model choices, but the process doesn’t have to be overwhelming. When you know what you’re looking for, and set a budget, it can be easy to make a decision you’ll be happy with. Take inventory of your needs and desires. First, think about why you’re making the purchase. Awnings not only provide shade and protection from the weather outside, but also offer substantial energy-saving advantages for the inside of the home, depending on the number of windows and doors that are covered by the unit. - Installation: Installation is not included in the price of most awning purchases. It’s important to have a plan, and understand the cost that can be incurred by having a professional handle the installation. Most companies have local installers that can help for a reduced rate when you make a purchase directly from them. Self-installation may seem like a good way to save a few bucks, but before making that decision, be realistic with yourself about your abilities. These units are very heavy and require safe installation. 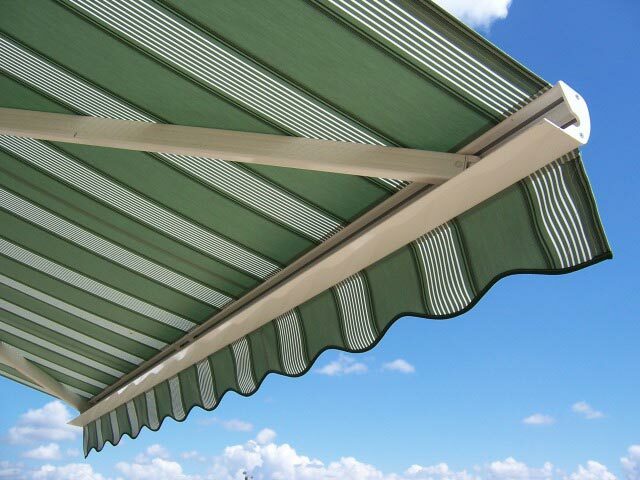 - Fabrics and Materials Used: Many awning retailers offer various types of fabrics and materials to choose from. Some provide full protection from the elements, while others are simply a shade from the sun. Daydream about the possibilities. If you want to spend rainy days sitting beneath your awning, listening to the falling drops, you’ll want a waterproof fabric or metal that can protect you from getting drenched. Also, awnings get a lot of sun, and not all fabric is resistant to fading. If the aesthetics of the unit is important, be sure to invest in an awning that is fade-resistant to ensure continued use in the future. - Weather: Just in the United States, weather varies to an extreme degree. Consider the weather in your locale before making a purchase. Southern Californians can probably get by with an awning that isn’t waterproof or resistant, but those who live in Florida will require protection from downpours. Snow and wind are other issues, and there are awnings that can handle the cold precipitation and blistery winds. However, with a retractable awning, these considerations aren’t as big of an issue as long as the unit is properly used and cared for. - Manual or Motorized? : Retractable awnings offer the perk of being able to open and close your awning with ease. There are two methods used, the manual option uses a hand crank, while motorized versions can extend or retract with the touch of a button. The strength and age of the user should be considered before making a purchase. For example, someone with arthritis would benefit from a motorized unit, while a young couple might be able to save money by purchasing a manual awning. - Surfaces: There are units that can be installed on any type of surface, like brick, wood, stucco or aluminum, but there are also some that require specific surface materials for installation. Be sure the unit you choose is compatible with your home. The purchase of an awning is a big decision, and a hefty investment. Before hitting the “Buy Now” button, it might be wise to contact the company over the phone to talk to a representative and make sure the unit will fit your lifestyle and the required specifications. Also, once you own a unit, provide proper cleaning and maintenance to extend the lifetime of your purchase.